This work will be the last of this series for some weeks/months – but I’ll surely continue this series in the future. The restless dream hasn’t ended yet. where people are made of glass. – let them free, run wild. I find this one not too complicated to link with the text. 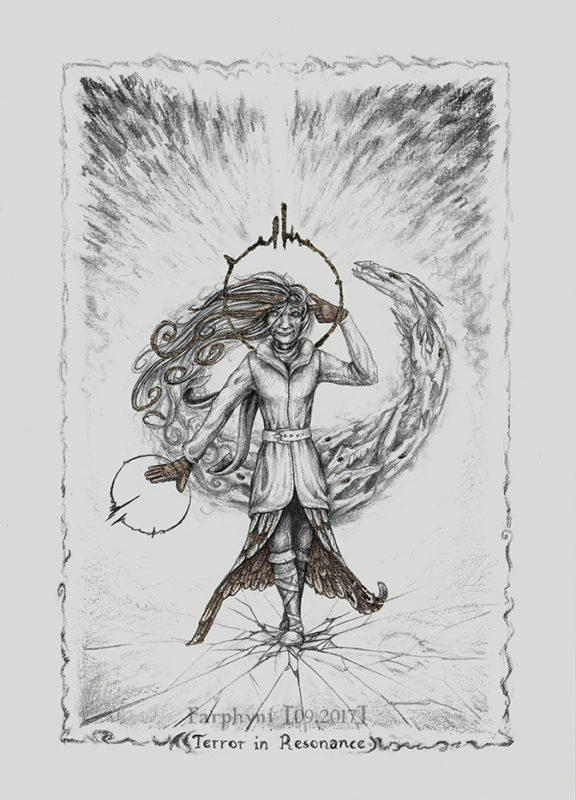 I suppose the circular thing is the resonance breaking the ice of the “normal” people and maybe also that she wears mantle and gloves to be cover by the shadows. I don’t really see the link, beside the style, between the different works of the series, though. “Are you sure that we are awake?” Remind me the lore of the Elder Scrolls (maybe I’ve already speak with you about it): the whole universe is a mere dream of the Godfather and, if there is several way for someone to become a god in this world, it always implies to become conscious that their life is a dream (hence the sentence “the dreamer is awake” that can be read sometimes about it). If you think differently you don’t belong to this circle, to the unisono, you’re the terror in the resonance, the chaos in their order. Therefore one better hides in the shadows. But if one truly wants to accomplish something, truly longs for a better tomorrow, a peaceful one, you can’t stay there. Can I have an upgrade to be able to transform people into salsify? Games are good, though they don’t speak in a very obvious way of those things (to understand that kind of things you have to carefully read all the in-game books and listen all the npcs say and put everything together). Older games spoke really more of it, since the dialog weren’t voiced, so it allowed the npc to have far longer text, hence more explanations. Ah yeah, totally agree with you with the cycling tendency of history, my favourite example of it is the comparison between the two Punic War and the two World War: they’re nearly the same. I think the heart of the problem is that politics are on one hand ignorant dunce about history (and not only about history for most of them) and on the other hand they are so convinced of their superiority that they think that those problems are not going to apply to them. Remind me the conception of time in the books of Robin Hobb: time is seen as wheel turning in a circle (hough I think a coil would represent it better). If nothing is done the same things repeat themselves and the world tends to get worse. So the books show how the White Prophets are trying to put pebbles under the wheel to make it change its course and go on a better way, just by avoiding the events to repeat too much.